Peoria, Arizona (March 30th, 2019) 250 local handmade shops, bakeries, small businesses and food trucks gather for a day of shopping and fun. Come support some of Arizona's best local shops all in one place. 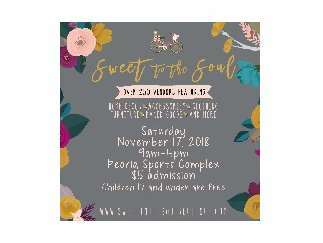 Sweet to the Soul Boutique is a family event held at Peoria Sports Complex. Shops will open on March 30th from 9am -4pm on the concourses. The first 100 shoppers through gate B will receive a free Swag Bag. Admission for 18+ is $5 and parking is free. Our dream when creating Sweet to the Soul, was to create a positive heartfelt environment to gather and celebrate the talents within our community. Our market has surpassed our expectations. Our vendors have created a event you will not want to miss.